You are in for a delicious treat! 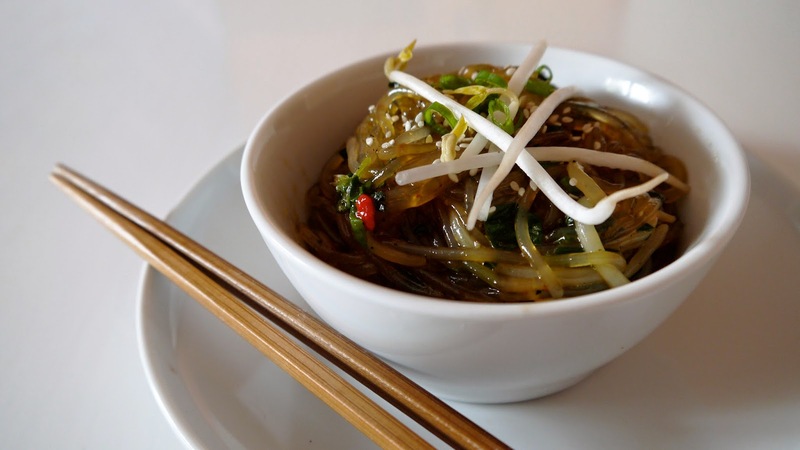 Japchae: Glass noodles made from sweet potatoes; gluten free; beautiful chewy texture that is unlike any other noodle. Like a lot of starch dishes, noodles will pick up flavours of whatever you season them with. In this case, japchae tastes like sweet soy – sesame sauce with vegetables. It is truly amazing and can be served as a main or a side. This is a very easy dish to prepare, and the noodles can be found in most East Asian grocery stores. Boil the Japchae noodles for 5-8 minutes, or until soft, drain and set aside. In a large frying pan add a few drops of vegetable oil and lightly sauté carrots, pepper, garlic, and bean sprouts for a few minutes until they wilt. In a large bowl, toss the sautéed veggies, noodles, sugar, sesame oil, soy sauce, and pepper.